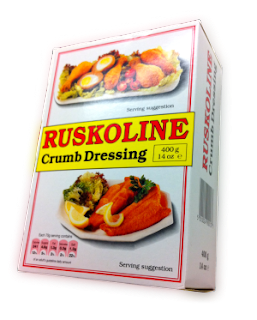 Ruskoline is described as "crumb dressing". In fact, it's the best suit of clothes a piece of chicken ever wore. It is also a very versatile product that is always to be found in my kitchen cabinet. And Ruskoline isn't just for savoury dishes either. It is often seen as a way of dressing fish or chicken but I have experimented with using it for all kinds of dishes in my kitchen. I have made bread sauce with it, I have added it to soups and stews to add body. I have even used it in desserts. Mix Ruskoline with a little melted butter and it makes a great base for cheesecakes. Blighty's recipes blog has a couple of interesting recipes using Ruskoline and both are easy to make. One is savoury (Fried Brussels Sprouts) and the other is a dessert (Queen of Puddings). Why not pick some Ruskoline as a standby and see what great meals you can make with it. Ruskoline lasts for a very long time if you keep it wrapped up and dry.